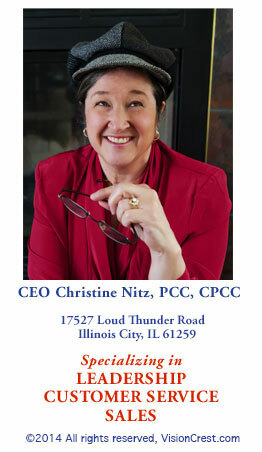 Contact Executive Coach and Business Development Trainer Christine Nitz today. Training: VisionCrest certified trainers and course developers will deliver workshops and seminars designed to get results. We specialize in Sales, Leadership and Customer Service training and will customize programs to fit your specific needs. We will help you promote from within, train new staff before bad habits set in, and prepare today’s subject matter experts for tomorrow’s leadership positions. Contact cnitz@visioncrest.com to schedule your next workshop or seminar. Keynote Addresses: Are you responsible for booking speakers for your next event? If you want to break the ice at meetings, get workshops off to an interactive start or set the stage for cooperation and creativity, you want to book Christine Nitz as your next speaker. Her practical approach and sense of humor get audiences involved and keep them engaged. Contact cnitz@visioncrest.com to book a dynamic speaker for your next event.